The Millennial Freemason: Installation 2009, Wow! 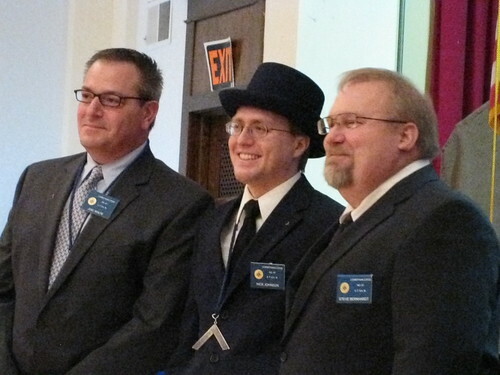 My Lodge, Corinthian #67, had our Annual Installation of Officers for 2009-2010 on December 6th. My Lodge brothers elected me as Worshipful Master. I am truly honored and blessed that the brothers of my Lodge have faith in my abilities especially as I am still a pup of 27 years. I am excited for the upcoming year as I wish to continue the past few years successes in membership, temple restoration and programming. This year, I am focusing my efforts on three guiding principles: experimentation, excellence, and excitement. I truly believe these three thoughts are the key to getting a more worthwhile lodge experience. As I said in my remarks to the brethren, families and guests, we, at Corinthian Lodge, are going to try lots of new things that we have never done before. We are going to hold more Table Lodges, more schools of instruction, more fundraising activities, more educational programs; in short, we're going to give to our brethren what I believe they deserve, a more meaningful Lodge experience. Quantity and quality need not be competitors of each other. It is about finding the right balance. As President and Brother Theodore Roosevelt said, "In any moment of decision the best thing you can do is the right thing, the next best thing is the wrong thing, and the worst thing you can do is nothing." We must do more to find out what works or what doesn't work. I want to treat my Lodge as a laboritory, testing new ideas in an effort to make good on our promise as a progressive science. Masonry stands upon a precipice. Unfortunately, as a Craft, many brothers look down the cliffface instead of seeing that there is another side, across the gorge. We need only bridge to the other side to save the Fraternity that we love. I believe my brothers and I have the tools and the talent in to continue building and strengthening our Lodge. Finally, I want to thank those people that have always helped me. I first want to thank my wife who has allowed me to take part in something I have found I truly love doing. Without her support, I would not be half the Freemason I am today. I would also like to thank my parents for giving me their support as well as my dad for being willing to serve as sky pilot (chaplain) for next year. I also want to thank my Grandpa, a 60 year member for getting me into Masonry, and my Grandmas (maternal and paternal) as well as my brother and his fiancee for attending and giving their support to me. I would also like to thank Karen, my organist, for doing a great job. She has known me since before I was born and has always been there to help me if I needed it. I want to thank the brothers of Corinthian Lodge for giving me this opportunity to try new things. We have a great year ahead of us. Brothers, let's get to work. Congrats, again! Keep us updated on how your lodge is progressing through 2010! Thanks Brother Jon. I hope to list all the activities we try out this year. Experimentation is one of my guiding principles and I hope to try many new programs. No problem. I'm just glad that you have such a progressive lodge willing to do things different from "the way it's always been done." That was really nice. God willing, that'll be me next May here in London. Congrats! My boyfriend will be finishing his term as WM later this month ... he's 29, one of the youngest WM's his lodge has ever had. Have fun!!! Congratulations and I hope your year goes well. Tell your boyfriend, congrats. Being willing to take the gavel comes with a great many rewards and challenges. Congratulations on being installed in the Oriental Chair. I'm looking forward to reading your blog during the coming year to hear of all the wonderful things that you will be doing in Corinthian Lodge #67.